It’s been a while since I made bacon, but I’ve also been dreaming about Pork Belly Confit. This recipe (Jim Drohman’s Pork Belly Confit) comes from the book Charcuterie by Michael Ruhlman and Brian Polcyn. I purchased this book and have been working through and around it. It is the basis of Charcutepalooza, which I have been involved in. 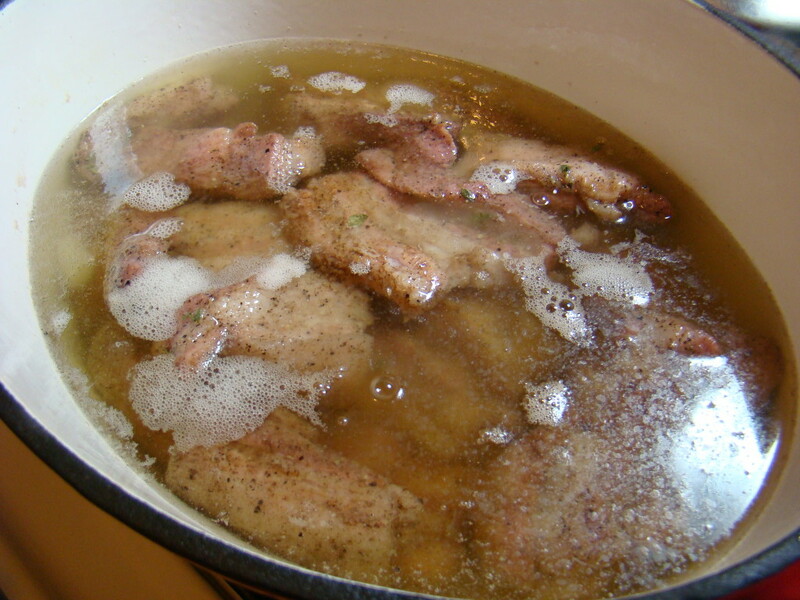 Pork belly confit….. hmmm porkbelly, cured then poached in pork fat until tender. This will keep for months in the fridge (how long do you reallythink it will last? 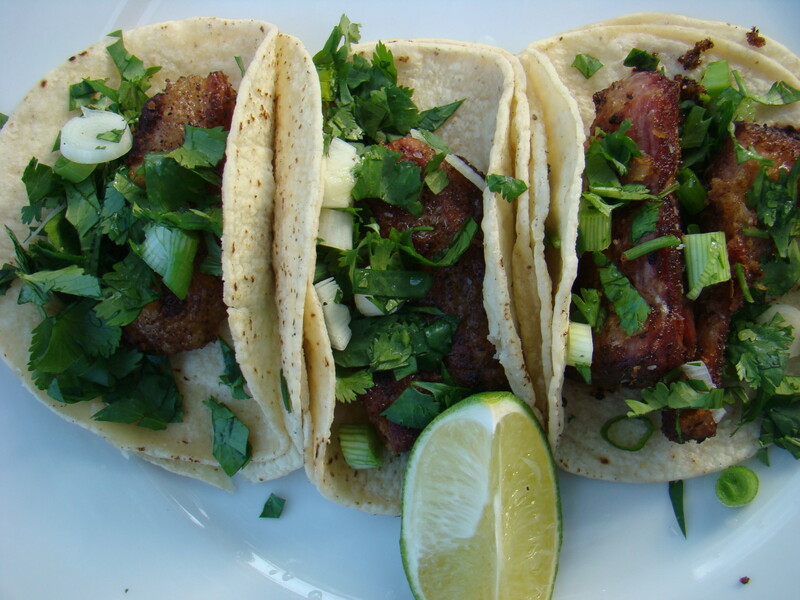 ), then fry some up and make fatty, crispy, succulent Taco’s. I think I might pass out! Since I am only using 3 lbs of pork belly I’ve cut the recipe in half. Dry white wine as needed. 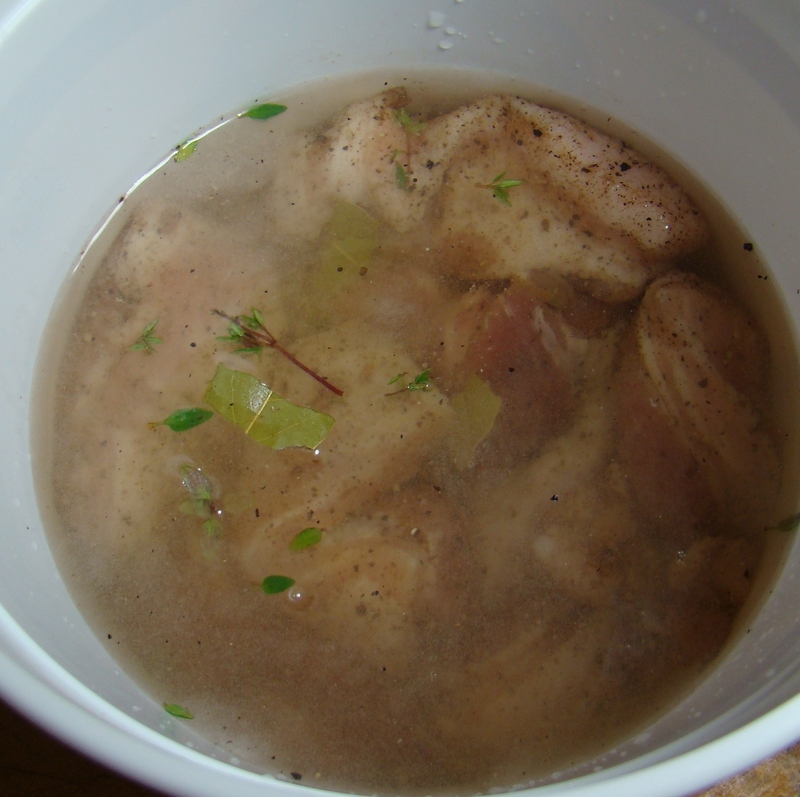 Toss the pork chunks and the cure ingredients in a big bowl to coat evenly. Pack coated pork into a non-reactive container. This goes into the fridge for 24-36 hours. 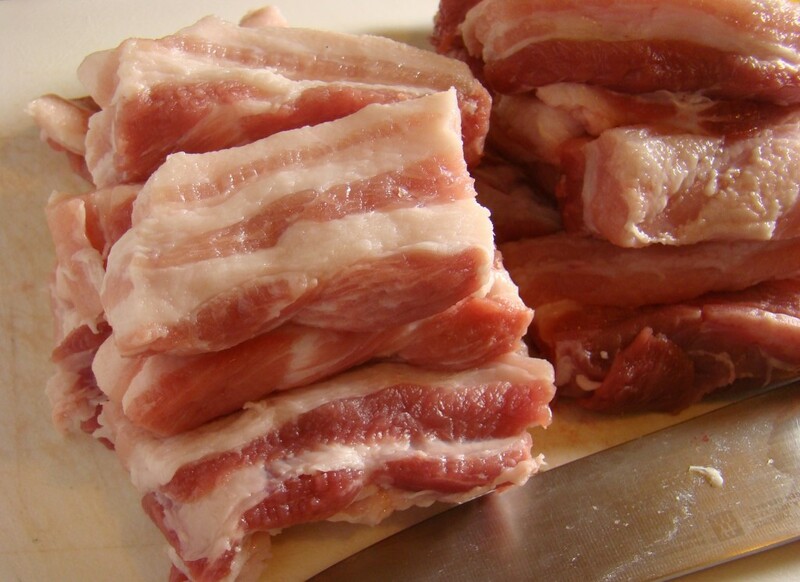 Remove the pork from the cure and pat the pieces dry with paper towels. 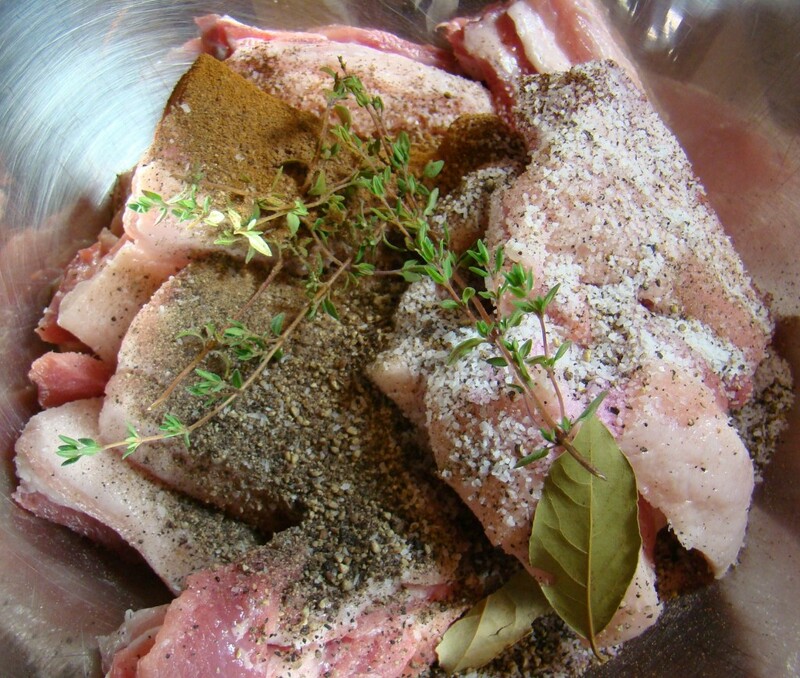 Place pork in an ovenproof pot or Dutch oven and cover with the rendered fat. And this is where the wheels came off – sorta. The fat that I had purchased had a lot of particulate matter in it and was nutty brown. 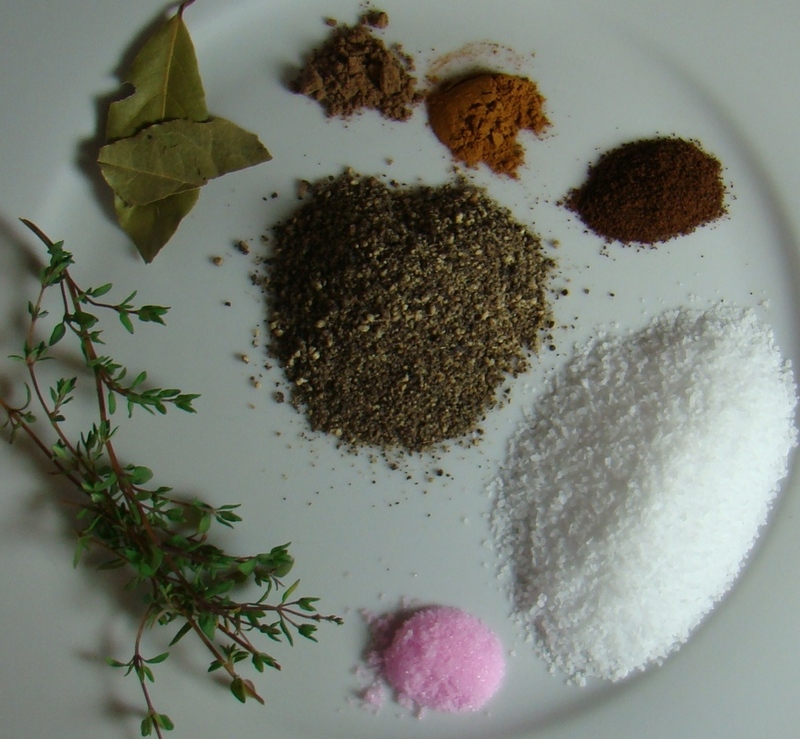 So I tried to filter it out – a little heat, some coffee filters and, well…. I did get a bit of the sediment out but I did not like the way it tasted. I made an executive decision and went for the lard. It is pork fat, and it’s produced by a huge faceless corporation, and I feel a little guilty. I’ll get over it. I just don’t want to mess up the confit. Bring to a simmer on the stovetop. 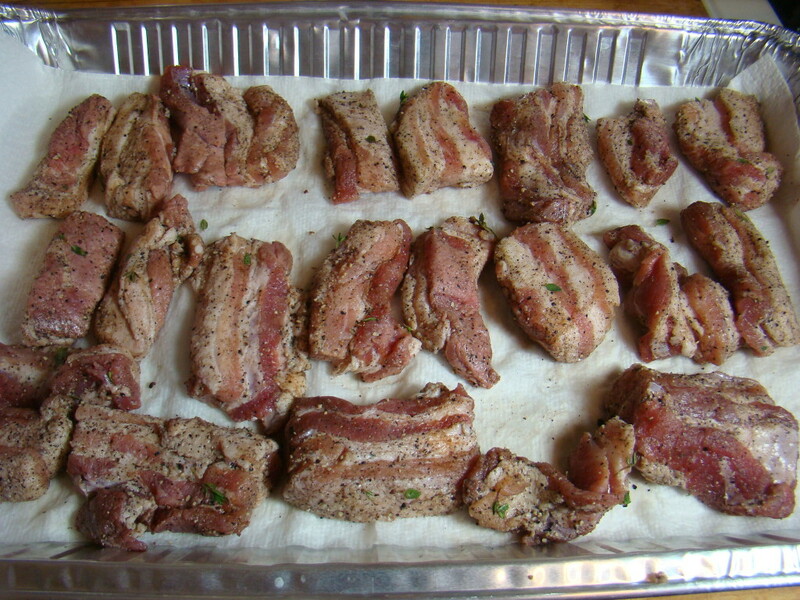 Then place in the oven, uncovered, and cook until the pork is fork-tender, about 2 to 3 hours. Remove the pork from the oven and cool to room temperature in the fat. Refrigerate the pork in the pan it was cooked in or transfer to another container and add the fat; the pork should be completely submerged in the fat. Refrigerate until completely chilled, or for up to 2 months. In a deep-heavy pot, heat the oil for deep-frying 350 to 375. 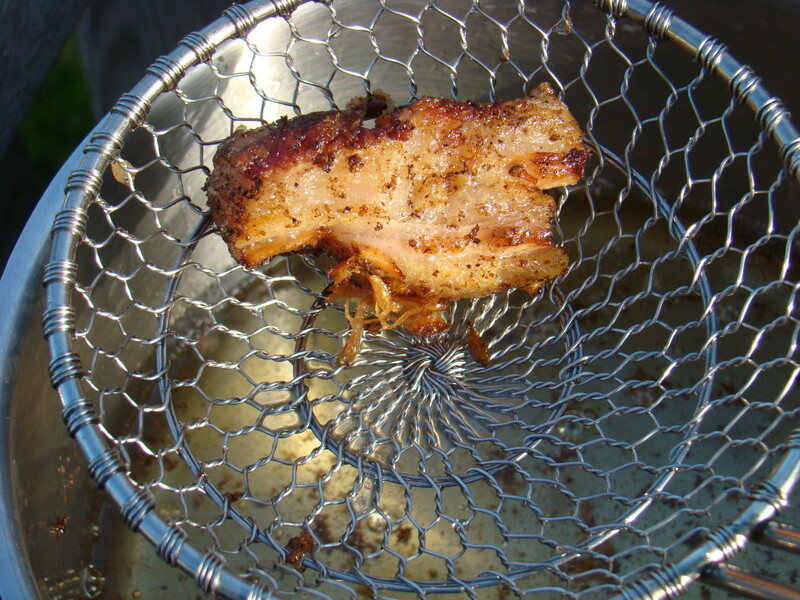 Deep-fry the pork belly until crispy and heated through, about 2 minutes if it was at room temperature. Remove and drain on paper towels. Add a dash of coarse salt. 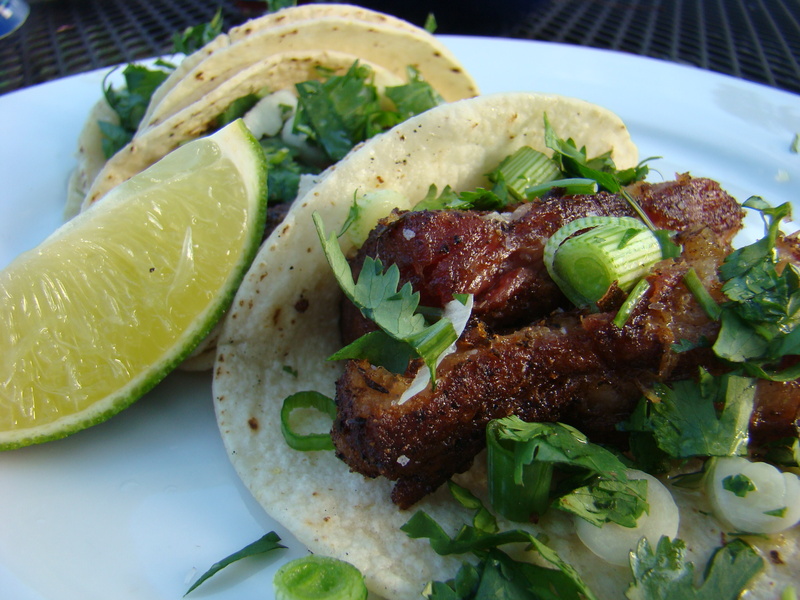 I made tacos – simple with cilantro, onion and a squeeze of lime. Hot, salty, crunchy outside; fatty, rich, meltingly tender inside. Sublime. Not something to have every day, but once in a while? You have to live right? This was not difficult to do, and the rewards are simple yet spectacular! Until next time, Eat Well & Keep Digging! Sounds great, but definitely not one for inclusion in a low-fat diet! It's a fact that fat makes food taste and feel nicer. Agreed Mark, it is a once in a while treat. An occasional indulgence doesn't have the impact of a habitual high fat diet. Foie gras is delicious, but I don't want it all the time. i'm SWOONING over this!!! wow!! and to think i got me some pork belly right in the freezer! excellent work as always! Ohiofarmgirl – you made my day! Swoon is what I'm shooting for. To have pork belly in the fridge from home raised hogs? That sounds divine!